﻿ Liveblog: MIPLab 2015 Winner RightsTrade is "Airbnb for content licensing"
Wildmoka wins audience vote. Our full report of MIPTV's startup competition! Above, left to right: Sarah Hemar, Reed MIDEM, with jury members Oscar Hoglünd of Epidemic Sound; Farid Mokart of Fred & Farid Group; MIPLab winner Steven Polster of RightsTrade; jury members Múirne Laffan of RTE Digital & Caroline Casey of Yahoo7; Jacques-Edouard Sabatier of Canal+; and Reed MIDEM’s Laurine Garaude. Below: our interviews with the winners! 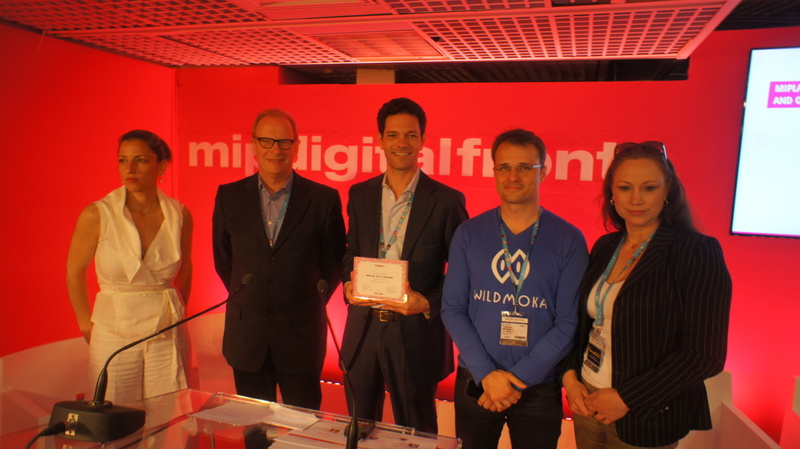 MIPBlog spoke to Steven Polster, CEO of RightsTrade and winner of MIPLab 2015, and Thomas Menguy, co-founder of audience vote winner Wildmoka. MIPLab 2015 is the only global B2B startup competition in TV and online video, and was sponsored this year by CanalStart and Canal+. Jury Prize winner RightsTrade is a global marketplace for TV, film and digital rights licensing. The prize includes support and follow-up from CanalStart and Canal+ for further development of the project. WildMoka, which calls itself “a kind of cut & paste for live and archive videos“, won the audience vote, sweeping 42% of votes following the pitches. “It was very close, for a while we actually had two winners,” said Jacques-Edouard Sabatier, digital content director of Canal+. But RightsTrade, in the end, pulled ahead. According to Polster, “Buyers and sellers spend most of their time and resource dealing with painful administrative activities” like payments and deliveries, and updating rights management software. “Because of this long process, it takes 6-9 months to close most deals,” he said. Whereas RightsTrade couldn’t have been possible a few years ago, the majority of rights holders today use rights management software. Today, RightsTrade has partnered with major rights management platform FilmTrack to easily onboard their clients. “We’ve already delivered over 40,000 screenings between markets and sellers,” and can equip a market of buyers and sellers that equal the attendance of MIPTV, Polster added. Their special DealWizard feature just launched, and now makes content licensing “as easy as booking a room on Airbnb!” he claims. Audience vote winner Wildmoka was presented by co-founder Thomas Menguy. The company is building an agile media cloud that provides new ways to distribute, consume and play with video content. For example, you could pull a clip out of a Canal+ sports video, then immediately share just that clip on Twitter. Canal+ would automatically be able to profit from your share, because that piece of content would still be tied to the original video. The pitch session was presented by FABERNOVEL’s lead project manager, Raphaëlle Toledano. The other pitchers in the running included (left to right) founder/CEO Michal Huschmann of Relevancy Data, which scans online videos using recognition technology to detect elements in the video content for better contextual advertising; managing director Miles Bullough of Wildseed Studios, which acts as a go-between for young new video talent and big media companies; and, to the far right of winners Polster and Menguy, founder Annika Lidne of Dramatify, which facilitates mobile and social project management for the TV and film industries. Thanks to everyone for taking part, and congratulations to the winners!